Macedonians (Macedonian: Македонци, translit. Makedonci) are a nation and a South Slavic ethnic group native to the region of Macedonia. They speak the Macedonian language (Macedonian: македонски јазик, translit. makedonski jazik), a South Slavic language. About two thirds of all ethnic Macedonians live in North Macedonia and there are also communities in a number of other countries. The origins of Macedonians are varied. In antiquity, much of central-northern Macedonia (the Vardar basin) was inhabited by Paionians who expanded from the lower Strymon basin. The Pelagonian plain was inhabited by the Pelagones, an ancient Greek tribe of Upper Macedonia; whilst the western region (Ohrid-Prespa) was said to have been inhabited by Illyrian tribes. During the late Classical Period, having already developed several sophisticated polis-type settlements and a thriving economy based on mining, Paeonia became a constituent province of the Argead – Macedonian kingdom. Roman conquest brought with it a significant Romanization of the region. During the Dominate period, 'barbarian' federates were at times settled on Macedonian soil; such as the Sarmatians settled by Constantine (330s AD) or the (10 year) settlement of Alaric's Goths. In contrast to 'frontier provinces', Macedonia (north and south) continued to be a flourishing Christian, Roman province in Late Antiquity and into the early Middle Ages. Linguistically, the South Slavic languages from which Macedonian developed are thought to have expanded in the region during the post-Roman period, although the exact mechanisms of this linguistic expansion remains a matter of scholarly discussion. Traditional historiography has equated these changes with the commencement of raids and 'invasions' of Sclaveni and Antes from Wallachia and western Ukraine during the 6th and 7th centuries. However, recent anthropological and archaeological perspectives have viewed the appearance of Slavs in Macedonia, and throughout the Balkans in general, as part of a broad and complex process of transformation of the cultural, political and ethno-linguistic Balkan landscape after the collapse of Roman authority. The exact details and chronology of population shifts remain to be determined. What is beyond dispute is that, in contrast to Bulgaria, northern Macedonia remained "Roman" in its cultural outlook into the 7th century, and beyond. Yet at the same time, sources attest numerous Slavic tribes in the environs of Thessaloniki and further afield, including the Berziti in Pelagonia. Apart from Slavs and late Byzantines, Kuver's Avar Pannonian "Bulgars" – a mix of Roman Christians, Bulgars and Avars – settled the Keramissian plain (Pelagonia) around Bitola in the late 7th century. Later pockets of settlers included Magyars in the 9th century, Armenians in the 10th–12th centuries, Cumans in the 11th–13th centuries, and Saxon miners in the 14th and 15th centuries. Having previously been Byzantine clients, the Sklaviniae of Macedonia probably switched their allegiance to Bulgaria during the reign of Empress Irene, and was gradually incorporated into the Bulgarian Empire after the mid-9th century. Subsequently, the literary and ecclesiastical centres in Ohrid, not only became a second cultural capital of medieval Bulgaria, but soon eclipsed those in Preslav. [dubious – discuss] Many aspects which now define Macedonian culture are a culmination of the so-called "Byzantine commonwealth" which consisted of Medieval Byzantine, Bulgarian and Serbian Empires. Cultural, ecclesiastical and political developments of Slavic Orthodox Culture occurred in Macedonia itself. Anthropologically, Macedonians possess genetic lineages postulated to represent Balkan prehistoric and historic demographic processes. Such lineages are also typically found in other South Slavs, especially Bulgarians, Serbs, Bosniaks, Montenegrins, but also to the Greeks and Romanians. A study was organized that compared all Slavic nations and combined all lines of evidence, autosomal, mtDNA and y-DNA, including more than 6000 people. The overall data situates the southeastern group (Bulgarians and Macedonians) in a cluster together with Romanians, and they are at similar proximity to Gagauzes, Montenegrins and Serbs. This study itself calculated genetic distance by SNP data of the multiple autosomes and ranked most proximal to Macedonians again the same group, i.e. the Bulgarians, the Serbs, Montenegrins, Romanians, Gagauzes, then Macedonian Greeks, etc. The large majority of Macedonians identify as Eastern Orthodox Christians, who speak a South Slavic language, and share a cultural and historical "Orthodox Byzantine–Slavic heritage" with their neighbours. The concept of a "Macedonian" ethnicity, distinct from their Orthodox Balkan neighbours, is seen to be a comparatively newly emergent one. The earliest manifestations of incipient Macedonian identity emerged during the second half of the 19th century among limited circles of Slavic intellectuals, predominantly outside the region of Macedonia. They arose after the First World War and especially during 1930s, and thus were consolidated by Communist Yugoslavia's governmental policy after the Second World War. During the Middle Ages, there was no distinct ethno-political Macedonian identity. References to "Macedonians" were varied, from geographical to administrative one. The Byzantine historians categorized the numerous Slavic tribal unions on the early Medieval Balkans as 'Sclavinias' and often associated them with particular tribes. In the ninth century, Theophanes the Confessor reported that the emperor Constantine V captured the Macedonian Sklavinias (small, tribal statelets of the Slavs who settled the Balkans after the collapse of the Avars) in the year 758–759. The modern Macedonian historians have described it as some kind of primary ethno-political entity, but such views are doubtful. These Slavs did not have sufficient state-building skills, they failed to unite them and in the 8th century they were reconquered by the Byzantines. On the other hand, recent publications by Florin Curta describe the great Slavic invasion of the 6th and 7th century on the Balkans and particularly in Macedonia as a 19th-century historical exaggeration. Thus, the construction of the first South Slavic states was organized by the Croats, Serbs, and Bulgarians and the local (Slavic) population in today Republic of North Macedonia was conquered by the Bulgars in the middle of the 9th century. The Slavs were self-governing in their extended families and districts (županije), and their tribal organization was sufficiently strong to abolish Byzantine rule in the Balkans… But these Slavs did not have marked state-building skills. The construction of the first South Slavic states was accomplished under, the auspices of subsequent invaders, who gave the rise of three South Slavic matrix-nationalities. These were Croats, Serbs and Bulgars. Yet, throughout the Middle Ages and Ottoman rule up until the early 20th century the Slavic population majority in the region of Macedonia were more commonly referred to both (by themselves and outsiders) as Bulgarians. However, in pre-nationalist times, terms such as "Bulgarian" did not possess a strict ethno-nationalistic meaning, rather, they were loose, often interchangeable terms which could simultaneously denote regional habitation, allegiance to a particular empire, religious orientation, membership in certain social groups. Similarly, a "Byzantine" was a Roman subject of Constantinople, and the term bore no strict ethnic connotations, Greek or otherwise. Overall, in the Middle Ages, "a person's origin was distinctly regional". After the final Ottoman conquest of the Balkans by the Ottomans in the 15th century, all Eastern Orthodox Christians were included in a specific ethno-religious community under Graeco-Byzantine jurisdiction called Rum Millet. The belonging to this religious commonwealth was so important that most of the common people began to identify themselves as Christians. However ethnonyms never disappeared and some form of primary ethnic identity was available. This is confirmed from a Sultan's Firman from 1680 which describes the ethnic groups in the Balkan territories of the Empire as follows: Greeks, Albanians, Serbs, Vlachs and Bulgarians. The rise of nationalism under the Ottoman Empire in the early 19th century brought opposition to this continued situation. At that time the classical Rum Millet began to degrade. The coordinated actions, carried out by Bulgarian national leaders supported by the majority of the Slavic population in today Republic of North Macedonia in order to be recognized as a separate ethnic entity, constituted the so-called "Bulgarian Millet", recognized in 1870. At the time of its creation, people living in Vardar Macedonia, were not in the Exarchate. However, as a result of plebiscites held between 1872 and 1875, the Slavic districts in the area voted overwhelmingly (over 2/3) to go over to the new national Church. Referring to the results of the plebiscites, and on the basis of statistical and ethnological indications, the 1876 Conference of Constantinople included most of Macedonia into the Bulgarian ethnic territory. The borders of new Bulgarian state, drawn by the 1878 Treaty of San Stefano, also included Macedonia, but the treaty was never put into effect and the Treaty of Berlin (1878) "returned" Macedonia to the Ottoman Empire. With the creation of the Bulgarian Principality, the Macedonian upper stratum had to decide whether Macedonia was to emerge as an independent state or as part of a "Greater Bulgaria". During this period, the first expressions of Macedonism by certain Macedonian intellectuals occurred in Belgrade, Sofia, Istanbul, Thessaloniki and St. Petersburg. The activities of these people was registered by Petko Slaveykov and Stojan Novaković The emergence of Macedonian identity was a relatively nascent and nebulous affair because Ottoman rule (a regimen which suppressed liberalism and nationalism) had lasted there the longest, the subsequent propaganda and armed conflict between newly formed Balkans monarchies (Greece, Bulgaria, Serbia) over Macedonian territory, and indeed the cultural similarity between Macedonians and their closest neighbours (especially Bulgarians). What do we call a nation? – People who are of the same origin and who speak the same words and who live and make friends of each other, who have the same customs and songs and entertainment are what we call a nation, and the place where that people lives is called the people's country. Thus the Macedonians also are a nation and the place which is theirs is called Macedonia. On the other hand, Theodosius of Skopje, a priest who have hold a high-ranking positions within the Bulgarian Exarchate was chosen as a bishop of the episcopacy of Skopje in 1885. As a bishop of Skopje, Theodosius renounced de facto the Bulgarian Exarchate and attempted to restore the Archbishopric of Ohrid and to separate the episcopacies in Macedonia from the Exarchate. During this time period Metropolitan Bishop Theodosius of Skopje made several pleas to the Bulgarian church to allow a separate Macedonian church, he viewed this as the only way to end the turmoil in the Balkans. I hope it will not be held against me that I, as a Macedonian, place the interests of my country before all... I am a Macedonian, I have a Macedonian's consciousness, and so I have my own Macedonian view of the past, present, and future of my country and of all the South Slavs; and so I should like them to consult us, the Macedonians, about all the questions concerning us and our neighbours, and not have everything end merely with agreements between Bulgaria and Serbia about us – but without us. Misirkov argued that a standard Macedonian literary language, in which Macedonians should write, study, and worship, should be created, based on the dialects spoken in the west-central part of what is today Republic of North Macedonia; the autocephalous Archbishopric of Ohrid should be restored; and the Slavic people of Macedonia should be identified in their Ottoman identity cards (nofuz) as "Macedonians". The next great figure of the Macedonian awakening was Dimitrija Čupovski, one of the founders of the Macedonian Literary Society, established in Saint Petersburg in 1902. In the period 1913–1918, Čupovski published the newspaper Македонскi Голосъ (Macedonian Voice) in which he and fellow members of the Petersburg Macedonian Colony propagated the existence of a Macedonian people separate from the Greeks, Bulgarians and Serbs, and sought to popularize the idea for an independent Macedonian state. After the Balkan Wars, following division of the region of Macedonia amongst the Kingdom of Greece, the Kingdom of Bulgaria and the Kingdom of Serbia, and after World War I, the idea of belonging to a separate Macedonian nation was further spread among the Slavic-speaking population. The suffering during the wars, the endless struggle of the Balkan monarchies for dominance over the population increased the Macedonians' sentiment that the institutionalization of an independent Macedonian nation would put an end to their suffering. On the question of whether they were Serbs or Bulgarians, the people more often started answering: "Neither Bulgar, nor Serb... I am Macedonian only, and I'm sick of war." The consolidation of an international Communist organization (the Comintern) in the 1920s led to some failed attempts by the Communists to use the Macedonian Question as a political weapon. In the 1920 Yugoslav parliamentary elections, 25% of the total Communist vote came from Macedonia, but participation was low (only 55%), mainly because the pro-Bulgarian IMRO organised a boycott against the elections. In the following years, the communists attempted to enlist the pro-IMRO sympathies of the population in their cause. In the context of this attempt, in 1924 the Comintern organized the filed signing of the so-called May Manifesto, in which independence of partitioned Macedonia was required. In 1925 with the help of the Comintern, the Internal Macedonian Revolutionary Organization (United) was created, composed of former left-wing Internal Macedonian Revolutionary Organization (IMRO) members. This organization promoted in the early 1930s the existence of a separate ethnic Macedonian nation. This idea was internationalized and backed by the Comintern which issued in 1934 a resolution supporting the development of the entity. This action was attacked by the IMRO, but was supported by the Balkan communists. The Balkan communist parties supported the national consolidation of the ethnic Macedonian people and created Macedonian sections within the parties, headed by prominent IMRO (United) members. The sense of belonging to a separate Macedonian nation gained credence during World War II when ethnic Macedonian communist partisan detachments were formed. In 1943 the Communist Party of Macedonia was established and the resistance movement grew up. After the World War II ethnic Macedonian institutions were created in the three parts of the region of Macedonia, then under communist control, including the establishment of the People's Republic of Macedonia within the Socialist Federal Republic of Yugoslavia (SFRJ). Following the collapse of Yugoslavia, the issue of Macedonian identity has again emerged. Nationalists and governments alike from neighbouring countries (especially Greece and Bulgaria) espouse to the view that the creation of a Macedonian ethnicity is a modern, artificial creation. Such views have been seen by Macedonian historians to represent irredentist motives on Macedonian territory. Moreover, western historians are quick to point out that in fact all modern nations are recent, politically motivated constructs based on creation "myths". The creation of Macedonian identity is "no more or less artificial than any other identity". Contrary to the claims of Romantic nationalists, modern, territorially bound and mutually exclusive nation states have little in common with the large territorial or dynastic medieval empires; and any connection between them is tenuous at best. In any event, irrespective of shifting political affiliations, the Macedonian Slavs shared in the fortunes of the Byzantine commonwealth and the Rum millet and they can claim them as their heritage. Loring Danforth states similarly, the ancient heritage of modern Balkan countries is not "the mutually exclusive property of one specific nation" but "the shared inheritance of all Balkan peoples". A more radical and uncompromising strand of Macedonian nationalism has recently emerged called "ancient Macedonism", or "Antiquisation". Proponents of such views see modern Macedonians as direct descendants of the ancient Macedonians. This policy is facing a criticism by academics as it demonstrates feebleness of archaeology and of other historical disciplines in public discourse, as well as a danger of marginalization of the Macedonian identity. Surveys on the effects of the controversial nation-building project Skopje 2014 and on the perceptions of the population of Skopje revealed a high degree of uncertainty regarding the latter's national identity. A supplementary national poll showed that there was a great discrepancy between the population's sentiment and the narrative the state sought to promote. The national name derives from the Greek term Makedonía, related to the name of the region, named after the ancient Macedonians and their kingdom. It originates from the ancient Greek adjective makednos, meaning "tall", which shares its roots with the adjective makrós, meaning the same. The name is originally believed to have meant either "highlanders" or "the tall ones", possibly descriptive of these ancient people. With the conquest of the Balkans by the Ottomans in the late 14th century, the name of Macedonia disappeared as a geographical designation for several centuries. The name was revived just during the early 19th century, after the foundation of the modern Greek state with its Western Europe-derived obsession with Ancient Greece. As result of the rise of nationalism in the Ottoman Empire, massive Greek religious and school propaganda occurred, and a process of Hellenization was implemented among Slavic-speaking population of the area. In this way, the name Macedonians was applied to the local Slavs, aiming to stimulate the development of close ties between them and the Greeks, linking both sides to the ancient Macedonians, as a counteract against the growing Bulgarian cultural influence into the region. As a consequence since 1850s some Slavic intellectuals from the area, adopted the designation Macedonian as a regional identity, and it began to gain a popularity. Serbian politics then, also encouraged this kind of regionalism to neutralize the Bulgarian influx, thereby promoting Serbian interests there. During the interbellum Bulgaria also supported to some extent the Macedonian regional identity, especially in Yugoslavia, to prevent the Serbianization of the local Slavs. Ultimately the designation Macedonian, changed its status in 1944, and went from being predominantly a regional, ethnographic denomination, to a national one. The history of the ethnic Macedonians has been shaped by population shifts and political developments in the region of Macedonia. Following the dissolution of the Ottoman Empire in the early 20th century, the decisive point in the ethnogenesis of the South Slavic ethnic group was the creation of the Socialist Republic of Macedonia after World War II, a state in the framework of the Socialist Federal Republic of Yugoslavia. The vast majority of ethnic Macedonians live along the valley of the river Vardar, the central region of the Republic of North Macedonia. They form about 64.18% of the population of North Macedonia (1,297,981 people according to the 2002 census). Smaller numbers live in eastern Albania, northern Greece, and southern Serbia, mostly abutting the border areas of the Republic of North Macedonia. A large number of Macedonians have immigrated overseas to Australia, United States, Canada and in many European countries: Germany, the United Kingdom, Italy, and Austria, among others. The existence of an ethnic Macedonian minority in Greece is rejected by the Greek government. The number of people speaking Slavic dialects has been estimated at somewhere between 10,000 and 250,000. Most of these people however do not have an ethnic Macedonian national consciousness, with most choosing to identify as ethnic Greeks or rejecting both ethnic designations. In 1999 the Greek Helsinki Monitor estimated that the number of people identifying as ethnic Macedonians numbered somewhere between 10,000 and 30,000, while Loring Danforth estimates it at around 10,000. Macedonian sources generally claim the number of ethnic Macedonians living in Greece at somewhere between 200,000–350,000. Since the late 1980s there has been an ethnic Macedonian revival in Northern Greece, mostly centering on the region of Florina. Since then ethnic Macedonian organisations including the Rainbow political party have been established. Rainbow has seen limited success at a national level, its best result being achieved in the 1994 European elections, with a total of 7,263 votes. Since 2004 it has participated in European Parliament elections and local elections, but not in national elections. A few of its members have been elected in local administrative posts. Rainbow has recently re-established Nova Zora, a newspaper that was first published for a short period in the mid 90's, with reportedly 20,000 copies being distributed free of charge. . Within Serbia, Macedonians constitute an officially recognised ethnic minority at both a local and national level. Within Vojvodina, Macedonians are recognised under the Statute of the Autonomous Province of Vojvodina, along with other ethnic groups. Large Macedonian settlements within Vojvodina can be found in Plandište, Jabuka, Glogonj, Dužine and Kačarevo. These people are mainly the descendants of economic migrants who left the Socialist Republic of Macedonia in the 1950s and 1960s. The Macedonians in Serbia are represented by a national council and in recent years the Macedonian language has begun to be taught. The most recent census recorded 22,755 Macedonians living in Serbia. Macedonians represent the second largest ethnic minority population in Albania. Albania recognises the existence of a Macedonian minority within the Mala Prespa region, most of which is comprised by Liqenas Municipality. Macedonians have full minority rights within this region, including the right to education and the provision of other services in the Macedonian language. There also exist unrecognised Macedonian populations living in the Golo Brdo region, the "Dolno Pole" area near the town of Peshkopi, around Lake Ohrid and Korce as well as in Gora. 4,697 people declared themselves ethnic Macedonians in the 1989 census. Bulgarians are considered most closely related to the neighboring Macedonians, indeed it is sometimes said there is no clear ethnic difference between them. As regards self-identification, a total of 1,654 people officially declared themselves to be ethnic Macedonians in the last Bulgarian census in 2011 (0,02%) and 561 of them are in Blagoevgrad Province (0,2%). 1,091 of them are Macedonian citizens, who are permanent residents in Bulgaria. Krassimir Kanev, chairman of the non-governmental organization Bulgarian Helsinki Committee, claimed 15,000–25,000 in 1998 (see here). In the same report Macedonian nationalists (Popov et al., 1989) claimed that 200,000 ethnic Macedonians live in Bulgaria. However, Bulgarian Helsinki Committee stated that the vast majority of the Slavic population in Pirin Macedonia has a Bulgarian national self-consciousness and a regional Macedonian identity similar to the Macedonian regional identity in Greek Macedonia. Finally, according to personal evaluation of a leading local ethnic Macedonian political activist, Stoyko Stoykov, the present number of Bulgarian citizens with ethnic Macedonian self-consciousness is between 5,000 and 10,000. The Bulgarian Constitutional Court banned UMO Ilinden-Pirin, a small Macedonian political party, in 2000 as separatist. Subsequently, activists attempted to re-establish the party but could not gather the required signatures to this aim. Argentina: Most Macedonians can be found in Buenos Aires, the Pampas and Córdoba. An estimated 30,000 Macedonians can be found in Argentina. Australia: The official number of Macedonians in Australia by birthplace or birthplace of parents is 83,893 (2001). The main Macedonian communities are found in Melbourne, Geelong, Sydney, Wollongong, Newcastle, Canberra and Perth. (The 2006 Australian Census included a question of 'ancestry' which, according to Members of the Australian-Macedonian Community, this will result in a 'significant' increase of 'ethnic Macedonians' in Australia. However, the 2006 census recorded 83,983 people of Macedonian (ethnic) ancestry.) See also Macedonian Australians. United States: A significant Macedonian community can be found in the United States of America. The official number of Macedonians in the USA is 49,455 (2004). The Macedonian community is located mainly in Michigan, New York, Ohio, Indiana and New Jersey (see also Macedonian Americans). Italy: There are 74,162 citizens of North Macedonia in Italy (Foreign Citizens in Italy). Other significant ethnic Macedonian communities can also be found in the other Western European countries such as Austria, France, Luxembourg, Netherlands, United Kingdom and the whole European Union. Also in Uruguay, with a significant population in Montevideo. The culture of the people is characterized with both traditionalist and modernist attributes. It is strongly bound with their native land and the surrounding in which they live. The rich cultural heritage of the Macedonians is accented in the folklore, the picturesque traditional folk costumes, decorations and ornaments in city and village homes, the architecture, the monasteries and churches, iconostasis, wood-carving and so on. The culture of Macedonians can roughly be explained as a Balkanic, closely related to that of Bulgarians and Serbs. 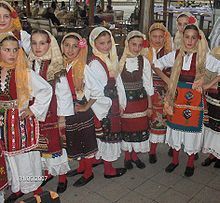 Macedonian girls in traditional folk costumes. The typical Macedonian village house is influelnced by Ottoman Architecture .Presented as a construction with two floors, with a hard facade composed of large stones and a wide balcony on the second floor. In villages with predominantly agricultural economy, the first floor was often used as a storage for the harvest, while in some villages the first floor was used as a cattle-pen. The stereotype for a traditional Macedonian city house is a two-floor building with white façade, with a forward extended second floor, and black wooden elements around the windows and on the edges. The history of film making in North Macedonia dates back over 110 years. The first film to be produced on the territory of the present-day the country was made in 1895 by Janaki and Milton Manaki in Bitola. From then, continuing the present, Macedonian film makers, in North Macedonia and from around the world, have been producing many films. From 1993 to 1994 1,596 performances were held in the newly formed republic, and more than 330,000 people attended. The Macedonian National Theater (drama, opera, and ballet companies), the Drama Theater, the Theater of the Nationalities (Albanian and Turkish drama companies) and the other theater companies comprise about 870 professional actors, singers, ballet dancers, directors, playwrights, set and costume designers, etc. There is also a professional theatre for children and three amateur theaters. For the last thirty years a traditional festival of Macedonian professional theaters has been taking place in Prilep in honor of Vojdan Černodrinski, the founder of the modern Macedonian theater. Each year a festival of amateur and experimental Macedonian theater companies is held in Kočani. Macedonian music has many things in common with the music of neighboring Balkan countries, but maintains its own distinctive sound. The founders of modern Macedonian painting included Lazar Licenovski, Nikola Martinoski, Dimitar Pandilov, and Vangel Kodzoman. They were succeeded by an exceptionally talented and fruitful generation, consisting of Borka Lazeski, Dimitar Kondovski, Petar Mazev who are now deceased, and Rodoljub Anastasov and many others who are still active. Others include: Vasko Taskovski and Vangel Naumovski. In addition to Dimo Todorovski, who is considered to be the founder of modern Macedonian sculpture, the works of Petar Hadzi Boskov, Boro Mitrikeski, Novak Dimitrovski and Tome Serafimovski are also outstanding. In the past, the Macedonian population was predominantly involved with agriculture, with a very small portion of the people who were engaged in trade (mainly in the cities). But after the creation of the People's Republic of Macedonia which started a social transformation based on Socialist principles, a middle and heavy industry were started. The Macedonian language (македонски јазик) is a member of the Eastern group of South Slavic languages. Standard Macedonian was implemented as the official language of the Socialist Republic of Macedonia after being codified in the 1940s, and has accumulated a thriving literary tradition. The closest relative of Macedonian is Bulgarian, followed by Serbo-Croatian. All the South Slavic languages, including Macedonian, form a dialect continuum, in which Macedonian is situated between Bulgarian and Serbian. The Torlakian dialect group is intermediate between Bulgarian, Macedonian and Serbian, comprising some of the northernmost dialects of Macedonian as well as varieties spoken in southern Serbia. The Macedonian alphabet is an adaptation of the Cyrillic script, as well as language-specific conventions of spelling and punctuation. It is rarely Romanized. One of the well-known monasteries – St. Panteleimon in Ohrid. Most Macedonians are members of the Macedonian Orthodox Church. 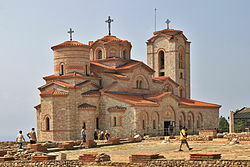 The official name of the church is Macedonian Orthodox Church – Ohrid Archbishopric and is the body of Christians who are united under the Archbishop of Ohrid and North Macedonia, exercising jurisdiction over Macedonian Orthodox Christians in the Republic of Macedonia and in exarchates in the Macedonian diaspora. The church gained autonomy from the Serbian Orthodox Church in 1959 and declared the restoration of the historic Archbishopric of Ohrid. On 19 July 1967, the Macedonian Orthodox Church declared autocephaly from the Serbian church, a move which is not recognised by any of the churches of the Eastern Orthodox Communion, and since then, the Macedonian Orthodox Church is not in communion with any Orthodox Church. Between the 15th and the 20th centuries, during Ottoman rule, a number of Orthodox Macedonian Slavs converted to Islam. Today in the Republic of North Macedonia they are regarded as Macedonian Muslims, who constitute the second largest religious community of the country. A small number of Macedonians belong to the Protestant and the Roman Catholic churches. Tavče Gravče, the national dish of Macedonians. Macedonian cuisine is a representative of the cuisine of the Balkans—reflecting Mediterranean (Greek) and Middle Eastern (Turkish) influences, and to a lesser extent Italian, German and Eastern European (especially Hungarian) ones. The relatively warm climate in Macedonia provides excellent growth conditions for a variety of vegetables, herbs and fruits. Thus, Macedonian cuisine is particularly diverse. Famous for its rich Shopska salad, an appetizer and side dish which accompanies almost every meal, Macedonian cuisine is also noted for the diversity and quality of its dairy products, wines, and local alcoholic beverages, such as rakija. Tavče Gravče and mastika are considered the national dish and drink of the Republic of North Macedonia, respectively. Sun: The official flag of the Republic of North Macedonia, adopted in 1995, is a yellow sun with eight broadening rays extending to the edges of the red field. Coat of arms: After independence in 1991, North Macedonia retained the coat of arms adopted in 1946 by the People's Assembly of the People's Republic of Macedonia on its second extraordinary session held on 27 July 1946, later on altered by article 8 of the Constitution of the Socialist Federal Republic of Macedonia. The coat-of-arms is composed by a double bent garland of ears of wheat, tobacco and poppy, tied by a ribbon with the embroidery of a traditional folk costume. In the center of such a circular room there are mountains, rivers, lakes and the sun. All this is said to represent "the richness of our country, our struggle, and our freedom". Lion: The lion first appears in the Fojnica Armorial from 17th century, where the coat of arms of Macedonia is included among those of other entities. On the coat of arms is a crown; inside a yellow crowned lion is depicted standing rampant, on a red background. On the bottom enclosed in a red and yellow border is written "Macedonia". The use of the lion to represent Macedonia was continued in foreign heraldic collections throughout the 16th to 18th centuries. Modern versions of the historical lion has also been added to the emblem of several political parties, organizations and sports clubs. However, this symbol is not totally accepted while the state coat of arms of Bulgaria is somewhat similar. Vergina Sun: (official flag, 1992–1995) The Vergina Sun is used unofficially by various associations and cultural groups in the Macedonian diaspora. The Vergina Sun is believed to have been associated with ancient Greek kings such as Alexander the Great and Philip II, although it was used as an ornamental design long before the Macedonian period. The symbol was discovered in the present-day Greek region of Macedonia and Greeks regard it as a misappropriation of a Hellenic symbol, unrelated to Slavic cultures, and a direct claim on the legacy of Philip II. In 1995, Greece lodged a claim for trademark protection of the Vergina Sun as a state symbol under WIPO. In Greece the symbol against a blue field is used vastly in the area of Macedonia and it has official status.The Vergina sun on a red field was the first flag of the independent Republic of Macedonia, until it was removed from the state flag under an agreement reached between the Republic of Macedonia and Greece in September 1995. The Vergina sun is still used unofficially as a national symbol by some groups in the country and Macedonian diaspora. Project of coat of arms of North Macedonia. ^ 2002 census Archived 21 June 2004 at the Wayback Machine. ^ a b c d e f g Republic of Macedonia MFA estimate Archived 26 June 2008 at the Wayback Machine. ^ Foreign Citizens in Italy, 2017 Archived 6 August 2017 at the Wayback Machine. ^ 2006 figures Archived 19 May 2011 at the Wayback Machine. ^ 2005 Figures Archived 3 March 2016 at the Wayback Machine. ^ "My Info Agent". Archived from the original on 18 January 2012. Retrieved 18 March 2015. ^ 2001 census Archived 15 February 2009 at the Wayback Machine. ^ "Попис у Србији 2011". Retrieved 18 March 2015. ^ Tabelle 13: Ausländer nach Staatsangehörigkeit (ausgewählte Staaten), Altersgruppen und Geschlecht — p. 74. ^ 1996 estimate Archived 5 July 2008 at the Wayback Machine. ^ Loring Danforth, National Conflict in a Transnational World: Greeks and Macedonians at the Conference on Security and Cooperation in Europe, Diaspora: A Journal of Transnational Studies 3(3), January 1994. ^ "Population by Ethnicity, by Towns/Municipalities, 2011 Census". Census of Population, Households and Dwellings 2011. Zagreb: Croatian Bureau of Statistics. December 2012. ^ Population by country of birth 2009. ^ "Belgium population statistics". dofi.fgov.be. Retrieved 9 June 2008. ^ 2008 figures Archived 12 January 2009 at the Wayback Machine. ^ 2003 census Archived 6 October 2014 at the Wayback Machine,Population Estimate from the MFA Archived 26 June 2008 at the Wayback Machine. ^ 2005 census Archived 3 March 2016 at the Wayback Machine. ^ a b Makedonci vo Svetot Archived 26 June 2008 at the Wayback Machine. ^ Polands Holocaust: Ethnic Strife, Collaboration with Occupying Forces and Genocide in the Second Republic, 1918–1947, p. 260. ^ "Rezultatele finale ale Recensământului din 2011 – Tab8. Populaţia stabilă după etnie – judeţe, municipii, oraşe, comune" (in Romanian). National Institute of Statistics (Romania). 5 July 2013. Retrieved 18 December 2013. ^ "2006 census". Archived from the original on 27 November 2007. Retrieved 2 October 2018. ^ "Eastern Europe and the Commonwealth of Independent States", p. 517 The Macedonians are a Southern Slav people, closely related to Bulgarians. ^ "Ethnic groups worldwide: a ready reference handbook", p. 54 Macedonians are a Slavic people closely related to the neighboring Bulgarians. ^ Day, Alan John; East, Roger; Thomas, Richard (2002). Political and economic dictionary of Eastern Europe. Routledge. p. 96. ISBN 9780203403747. ^ a b Florin Curta. Were there any Slavs in seventh-century Macedonia? p. 73 "In many respects, the communities who buried their dead in western Macedonia continued the traditions of late antiquity" and "have nothing to do with either 6th or 7th-century sites in the lower Danube.. or Bulgaria"
^ The Cambridge History of Early Inner Asia, Denis Sinor, Cambridge University Press, 1990, ISBN 0521243041, pp. 215–216. ^ The Early Medieval Balkans: A Critical Survey from the Sixth to the Late Twelfth Century, John Van Antwerp Fine, University of Michigan Press, 1991, ISBN 0472081497, p. 72. ^ Во некрополата "Млака" пред тврдината во Дебреште, Прилеп, откопани се гробови со наоди од доцниот 7. и 8. век. Тие се делумно или целосно кремирани и не се ниту ромеjски, ниту словенски. Станува збор наjвероjатно, за Кутригурите. Ова протобугарско племе, под водство на Кубер, а како потчинето на аварскиот каган во Панониjа, околу 680 г. се одметнало од Аварите и тргнало кон Солун. Кубер ги повел со себе и Сермесиjаните, (околу 70.000 на број), во нивната стара татковина. Сермесиjаните биле Ромеи, жители на балканските провинции што Аварите ги заробиле еден век порано и ги населиле во Западна Панониjа, да работат за нив. На Кубер му била доверена управата врз нив. In English: In the necropolis 'Malaka' in the fortress of Debreshte, near Prilep, graves were dug with findings from the late 7th and early 8th century. They are partially or completely cremated and neither Roman nor Slavic. The graves are probably remains from the Kutrigurs. This Bulgar tribe was led by Kuber... Средновековни градови и тврдини во Македонија. Иван Микулчиќ (Скопје, Македонска цивилизациjа, 1996) стр. 32–33. ^ "The" Other Europe in the Middle Ages: Avars, Bulgars, Khazars and Cumans, East Central and Eastern Europe in the Middle Ages, 450 – 1450, Florin Curta, Roman Kovalev,	BRILL, 2008, ISBN 9004163891, p. 460. ^ Stoianovich, Traian (September 1994). Balkan Worlds. ISBN 9780765638519. Retrieved 18 March 2015. ^ Marijana Peričić et al., High-Resolution Phylogenetic Analysis of Southeastern Europe Traces Major Episodes of Paternal Gene Flow Among Slavic Populations, Molecular Biology and Evolution, vol. 22, no. 10 (October 2005), pp. 1964–1975. ^ Jakovski, Zlatko; Nikolova, Ksenija; Jankova-Ajanovska, Renata; Marjanovic, Damir; Pojskic, Naris; Janeska, Biljana (2011). "Genetic data for 17 Y-chromosomal STR loci in Macedonians in the Republic of Macedonia". Forensic Science International: Genetics. 5 (4): e108–e111. doi:10.1016/j.fsigen.2011.04.005. PMID 21549657. Retrieved 18 March 2015. ^ Petlichkovski A, Efinska-Mladenovska O, Trajkov D, Arsov T, Strezova A, Spiroski M (2004). "High-resolution typing of HLA-DRB1 locus in the Macedonian population". Tissue Antigens. 64 (4): 486–91. doi:10.1111/j.1399-0039.2004.00273.x. PMID 15361127. ^ Barać, Lovorka; Peričić, Marijana; Klarić, Irena Martinović; Rootsi, Siiri; Janićijević, Branka; Kivisild, Toomas; Parik, Jüri; Rudan, Igor; Villems, Richard; Rudan, Pavao (2003). "European Journal of Human Genetics – Y chromosomal heritage of Croatian population and its island isolates". European Journal of Human Genetics. 11 (7): 535–542. doi:10.1038/sj.ejhg.5200992. PMID 12825075. ^ Semino, Ornella; Passarino, G; Oefner, PJ; Lin, AA; Arbuzova, S; Beckman, LE; De Benedictis, G; Francalacci, P; et al. (2000). "The Genetic Legacy of Paleolithic Homo sapiens sapiens in Extant Europeans: A Y Chromosome Perspective" (PDF). Science. 290 (5494): 1155–59. doi:10.1126/science.290.5494.1155. PMID 11073453. Archived from the original (PDF) on 25 November 2003. ^ "HLA-DRB and -DQB1 polymorphism in the Macedonian population". January 2000. Retrieved 18 March 2015. ^ Rebala K et al. (2007), Y-STR variation among Slavs: evidence for the Slavic homeland in the middle Dnieper basin, Journal of Human Genetics, 52:406-14. ^ "Genetic Heritage of the Balto-Slavic Speaking Populations: A Synthesis of Autosomal, Mitochondrial and Y-Chromosomal Data". PLOS ONE. 10: e0135820. doi:10.1371/journal.pone.0135820. PMC 4558026 Freely accessible. PMID 26332464. ^ Krste Misirkov, On the Macedonian Matters (Za Makedonckite Raboti), Sofia, 1903: "And, anyway, what sort of new Macedonian nation can this be when we and our fathers and grandfathers and great-grandfathers have always been called Bulgarians?" ^ Titchener, Frances B.; Moorton, Richard F. (1999). The eye expanded: life and the arts in Greco-Roman antiquity. Berkeley: University of California Press. p. 259. ISBN 978-0-520-21029-5. On the other hand, the Macedonians are a newly emergent people in search of a past to help legitimize their precarious present as they attempt to establish their singular identity in a Slavic world dominated historically by Serbs and Bulgarians. ... The twentieth-century development of a Macedonian ethnicity, and its recent evolution into independent statehood following the collapse of the Yugoslav state in 1991, has followed a rocky road. In order to survive the vicissitudes of Balkan history and politics, the Macedonians, who have had no history, need one. ^ Kaufman, Stuart J. (2001). Modern hatreds: the symbolic politics of ethnic war. New York: Cornell University Press. p. 193. ISBN 0-8014-8736-6. The key fact about Macedonian nationalism is that it is new: in the early twentieth century, Macedonian villagers defined their identity religiously—they were either "Bulgarian," "Serbian," or "Greek" depending on the affiliation of the village priest. ... According to the new Macedonian mythology, modern Macedonians are the direct descendants of Alexander the Great's subjects. They trace their cultural identity to the ninth-century Saints Cyril and Methodius, who converted the Slavs to Christianity and invented the first Slavic alphabet, and whose disciples maintained a centre of Christian learning in western Macedonia. A more modern national hero is Gotse Delchev, leader of the turn-of-the-century Internal Macedonian Revolutionary Organization (IMRO), which was actually a largely pro-Bulgarian organization but is claimed as the founding Macedonian national movement. ^ Rae, Heather (2002). State identities and the homogenisation of peoples. Cambridge: Cambridge University Press. p. 278. ISBN 0-521-79708-X. Despite the recent development of Macedonian identity, as Loring Danforth notes, it is no more or less artificial than any other identity. It merely has a more recent ethnogenesis – one that can therefore more easily be traced through the recent historical record. ^ Bonner, Raymond (14 May 1995). "The World; The Land That Can't Be Named". The New York Times. New York. Archived from the original on 29 January 2019. Retrieved 29 January 2019. Macedonian nationalism did not arise until the end of the last century. ^ Rossos, Andrew (2008). Macedonia and the Macedonians: A History (PDF). Hoover Institution Press. p. 269. ISBN 081794883X. Archived from the original (PDF) on 28 January 2019. Retrieved 28 January 2019. They were also insisting that the Macedonians sacrifice their national name, under which, as we have seen throughout this work, their national identity and their nation formed in the nineteenth century. ^ Rossos, Andrew (2008). Macedonia and the Macedonians: A History (PDF). Hoover Institution Press. p. 284. ISBN 081794883X. Archived from the original (PDF) on 28 January 2019. Retrieved 28 January 2019. Under very trying circumstances, most ethnic Macedonians chose a Macedonian identity. That identity began to form with the Slav awakening in Macedonia in the first half of the nineteenth century. ^ The Macedonian Question : Britain and the Southern Balkans 1939–1949. Retrieved 18 March 2015. ^ a b The Struggle for Greece, 1941–1949. Retrieved 18 March 2015. ^ a b Who are the Macedonians?. Retrieved 18 March 2015. ^ The first of these two Slavic groups was the Bulgaro-Macedonians... They were conquered by the Turkic Bulgars. The Slavs eventually assimilated them, but the Bulgars’ name survived. It denoted this Bulgaro-Macedonian Slavic group from the 9th century through the rest of medieval into modern times... Thus the reader should ignore references to ethnic Macedonians in the Middle ages which appear in some modern works...Nevertheless, the absence of a national consciousness in the past is no grounds to reject the Macedonians as a nationality today. "The Early Medieval Balkans: A Critical Survey from the Sixth to the Late Twelfth Century," John Van Antwerp Fine, University of Michigan Press, 1991, ISBN 0472081497, pp. 36–37. ^ The Edinburgh History of the Greeks; 500–1250: The Middle Ages. Florin Curta. 2013. p. 293 "The Byzantine Macedonian may well have been of some other ethnicity; as long as he was from the land of the Macedonians, he could be regarded as Macedonian"
^ Rossos, Andrew (2008). "Macedonia and the Macedonians: A History" (PDF). Hoover Institution Press. pp. 25–26. ISBN 081794883X. Archived from the original (PDF) on 28 January 2019. Retrieved 28 January 2019. ^ Some contemporary Macedonian historians have seen this tribal unions, referred to by the Byzantines as Sclaviniai as proto–states indicative of the formation of a new Slavic Macedonian ethnos at this early stage. However it is doubtful whether the Sclaviniai were sufficiently centralized polities. They also spread into Thrace, which is now not seen as part of the ethnic Macedonian homeland. Historical Dictionary of the Republic of Macedonia, Dimitar Bechev, Scarecrow Press, 2009, ISBN 0810862956, p. iI-iII. ^ The Former Yugoslavia's Diverse Peoples:, Matjaž Klemenčič, Mitja Žagar, ABC-CLIO, 2004, ISBN 1576072940, pp. 26–27. ^ The Macedonians: Their Past and Present, Ernest N. Damianopoulos, Palgrave Macmillan, 2012, ISBN 1137011904, p. 210. ^ The National Question in Yugoslavia: Origins, History, Politics, Ivo Banac, Cornell University Press, 1988, ISBN 0801494931, p. 33. ^ Who are the Macedonians?. Retrieved 18 March 2015. ^ "Средновековни градови и тврдини во Македонија, Иван Микулчиќ, Македонска академија на науките и уметностите – Скопје, 1996, стр. 72". Retrieved 18 March 2015. ^ Academician Dimitŭr Simeonov Angelov (1978). "Formation of the Bulgarian nation (summary)". Sofia-Press. pp. 413–415. Retrieved 18 March 2015. ^ When Ethnicity Did Not Matter in the Balkans. J V A Fine. pp. 3–5. ^ The Edinburgh History of the Greeks; 500–1250: The Middle Ages. Florin Curta. 2013. p. 294 (echoing Anthony D Smith and Anthony Kaldellis) "no clear notion exists that the Greek nation survived into Byzantine times...the ethnic identity of those who lived in Greece during the Middle Ages is best described as Roman." ^ Europe and the Historical Legacies in the Balkans. Retrieved 18 March 2015. ^ Balkan cultural commonality and ethnic diversity. Raymond Detrez (Ghent University, Belgium). ^ The A to Z of the Ottoman Empire, Selcuk Aksin Somel, Scarecrow Press, 2010, ISBN 1461731763, p. 168. ^ The Politics of Terror: The MacEdonian Liberation Movements, 1893–1903, Duncan M. Perry, Duke University Press, 1988, ISBN 0822308134, p. 15. ^ The A to Z of Bulgaria, Raymond Detrez, Scarecrow Press, 2010, ISBN 0810872021, p. 271. ^ The Bulgarian Jews and the Final Solution, 1940–1944. Retrieved 18 March 2015. ^ "The Macedonian question" published 18 January 1871. ^ Балканска питања и мање историјско-политичке белешке о Балканском полуострву 1886–1905. Стојан Новаковић, Београд, 1906. ^ a b c Rossos, Andrew (2008). "Macedonia and the Macedonians: A History" (PDF). Hoover Institution Press. ISBN 081794883X. Archived from the original (PDF) on 28 January 2019. Retrieved 28 January 2019. ^ Rečnik od tri jezika: s. makedonski, arbanski i turski [Dictionary of Three languages: Macedonian, Albanian, Turkish], U držacnoj štampariji, 1875, p. 48f. ^ Theodosius of Skopje Centralen D'rzhaven istoricheski archiv (Sofia) 176, op. 1. arh.ed. 595, l.5–42 – Razgledi, X/8 (1968), pp. 996–1000. ^ a b "上位表示されないので休止しました". Archived from the original on 20 December 2014. Retrieved 18 March 2015. ^ Историја на македонската нација. Блаже Ристовски, 1999, Скопје. ^ The Situation in Macedonia and the Tasks of IMRO (United) – published in the official newspaper of IMRO (United), "Македонско дело", N.185, April 1934. ^ Резолюция о македонской нации (принятой Балканском секретариате Коминтерна — Февраль 1934 г, Москва. ^ History of the Balkans, Vol. 2: Twentieth Century. Barbara Jelavich, 1983. ^ Rae, Heather (2002). State identities and the homogenisation of peoples. Cambridge: Cambridge University Press. p. 278. ISBN 0-521-79708-X. ^ The Handbook of Political Change in Eastern Europe, Sten Berglund, Edward Elgar Publishing, 2013, ISBN 1782545883,p. 622. ^ Transforming National Holidays: Identity Discourse in the West and South Slavic Countries, 1985–2010, Ljiljana Šarić, Karen Gammelgaard, Kjetil Rå Hauge, John Benjamins Publishing, 2012, ISBN 9027206384, pp. 207–208. ^ Muhić, Maja; Takovski, Aleksandar (2014): Redefining National Identity in Macedonia. Analyzing Competing Origins Myths and Interpretations through Hegemonic Representations. In Etnološka tribina 44 (37), p. 144. ^ Jelavich Barbara, History of the Balkans, Vol. 2: Twentieth Century, 1983, Cambridge University Press, ISBN 0521274591, page 91. ^ John S. Koliopoulos, Thanos M. Veremis, Modern Greece: A History since 1821. A New History of Modern Europe, John Wiley & Sons, 2009, ISBN 1444314831, p. 48. ^ Richard Clogg, Minorities in Greece: Aspects of a Plural Society. C. Hurst & Co. Publishers, 2002, ISBN 1850657068, p. 160. ^ Dimitar Bechev, Historical Dictionary of the Republic of Macedonia, Scarecrow Press, 2009, ISBN 0810862956, Introduction, pp. VII-VIII. ^ J. Pettifer, The New Macedonian Question, St Antony's group, Springer, 1999, ISBN 0230535798, pp. 49–51. ^ Anastas Vangeli, Nation-building ancient Macedonian style: the origins and the effects of the so-called antiquization in Macedonia. Nationalities Papers, the Journal of Nationalism and Ethnicity, Volume 39, 2011 pp. 13–32. ^ Roumen Daskalov, Tchavdar Marinov, Entangled Histories of the Balkans, Volume One: National Ideologies and Language Policies, BRILL, 2013, ISBN 900425076X, pp. 283–285. ^ Chris Kostov, Contested Ethnic Identity: The Case of Macedonian Immigrants in Toronto, 1900–1996, Peter Lang, 2010, ISBN 3034301960, p. 65. ^ Raymond Detrez, Pieter Plas, Developing cultural identity in the Balkans: convergence vs divergence, Volume 34 of Multiple Europesq Peter Lang, 2005, ISBN 9052012970, p. 173. ^ Bulgaria and Europe. Retrieved 18 March 2015. ^ "Ethnologue report for Greece". Ethnologue. Retrieved 13 February 2009. ^ UCLA Language Materials Project: Language Profile Archived 9 February 2011 at the Wayback Machine. ^ UCLA Language Materials Project: Language Profile Archived 5 June 2011 at the Wayback Machine. ^ L. M. Danforth, The Macedonian Conflict: Ethnic Nationalism in a Transnational World 1995, Princeton University Press. ^ Jacques Bacid, PhD Macedonia Through the Ages. Columbia University, 1983. ^ Hill, P. (1999) "Macedonians in Greece and Albania: A Comparative study of recent developments". Nationalities Papers Volume 27, 1 March 1999, p. 44(14). ^ Poulton, H.(2000), "Who are the Macedonians? ", C. Hurst & Co. Publishers. ^ The Macedonian Conflict. Retrieved 18 March 2015. ^ Culture and Rights. Retrieved 18 March 2015. ^ Second Macedonian newspaper in Greece – "Втор весник на Македонците во Грција...Весникот се вика "Задруга"...За нецел месец во Грција излезе уште еден весник на Македонците/A Second Macedonian Newspaper in greece...The Newspaper is Called "Zadruga/Koinothta"...Barely a month ago in Greece another newspaper for the Macedonians was released." ^ Македонците во Грција треба да си ги бараат правата Archived 23 August 2011 at the Wayback Machine – ""Нова зора"...печати во 20.000 примероци/Nova Zora...is printed in 20,000 copies"
^ "Нова зора" – прв весник на македонски јазик во Грција Archived 9 May 2010 at the Wayback Machine – ""Нова зора" – прв весник на македонски јазик во Грција...При печатењето на тиражот од 20.000 примероци се појавиле само мали технички проблеми/Nova Zora – the first Macedonian language newspaper in Greece...There were only small technical problems with the printing of the circulation of 20,000"
^ Нема печатница за македонски во Грција[permanent dead link] – "Весникот е наречен "Нова зора" и треба да се печати во 20.000 примероци/The Newspaper is called Nova Zora and 20,000 copies are printed." ^ Artan Hoxha and Alma Gurraj, Local Self-Government and Decentralization: Case of Albania. History, Reforms and Challenges. In: Local Self Government and Decentralization in South — East Europe. Proceedings of the workshop held in Zagreb, Croatia 6 April 2001. Friedrich Ebert Stiftung, Zagreb Office, Zagreb 2001, pp. 194–224 (PDF). ^ Day, Alan John; East, Roger; Thomas, Richard (2002). Political and economic dictionary of Eastern Europe. Routledge. p. 94. ISBN 1-85743-063-8. ^ "FOCUS Information Agency". focus-fen.net. Retrieved 14 March 2009. ^ Nasevski, Boško; Angelova, Dora. Gerovska, Dragica (1995). Македонски Иселенички Алманах '95. Skopje: Матица на Иселениците на Македонија. ^ Matkovski, Aleksandar, Grbovite na Makedonija, Skopje, 1970. ^ Floudas, Demetrius Andreas; ""A Name for a Conflict or a Conflict for a Name? An Analysis of Greece's Dispute with FYROM",". 24 (1996) Journal of Political and Military Sociology, 285. 1996. Archived from the original on 27 January 2006. Retrieved 24 January 2007. Brown, Keith, The Past in Question: Modern Macedonia and the Uncertainties of Nation, Princeton University Press, 2003. ISBN 0-691-09995-2. Brunnbauer, Ulf (September 2004). "Fertility, families and ethnic conflict: Macedonians and Albanians in the Republic of Macedonia, 1944–2002". Nationalities Papers. 32 (3): 565–598. doi:10.1080/0090599042000246406. Cowan, Jane K. (ed. ), Macedonia: The Politics of Identity and Difference, Pluto Press, 2000. A collection of articles. Curta, Florin (2011). The Edinburgh History of the Greeks, c. 500 to 1050: The Early Middle Ages. Edinburgh: Edinburgh University Press. Danforth, Loring M., The Macedonian Conflict: Ethnic Nationalism in a Transnational World, Princeton University Press, 1995. ISBN 0-691-04356-6. Karakasidou, Anastasia N., Fields of Wheat, Hills of Blood: Passages to Nationhood in Greek Macedonia, 1870–1990, University Of Chicago Press, 1997, ISBN 0-226-42494-4. Reviewed in Journal of Modern Greek Studies 18:2 (2000), p465. Mackridge, Peter, Eleni Yannakakis (eds. ), Ourselves and Others: The Development of a Greek Macedonian Cultural Identity since 1912, Berg Publishers, 1997, ISBN 1-85973-138-4. Poulton, Hugh, Who Are the Macedonians?, Indiana University Press, 2nd ed., 2000. ISBN 0-253-21359-2. Roudometof, Victor, Collective Memory, National Identity, and Ethnic Conflict: Greece, Bulgaria, and the Macedonian Question, Praeger Publishers, 2002. ISBN 0-275-97648-3. The Silent People Speak, by Robert St. John, 1948, xii, 293, 301–313 and 385. Karatsareas, Petros. "Greece's Macedonian Slavic heritage was wiped out by linguistic oppression – here's how". The Conversation. Retrieved 19 April 2018. Margaronis, Maria. "Greece's invisible minority - the Macedonian Slavs". BBC. Retrieved 24 February 2019.